The Road Way lorry magazine from 1937. Homepage. This page: A trade magazine for operators of 1930's lorries and other commercial vehicles. The Road Way, July 1937. 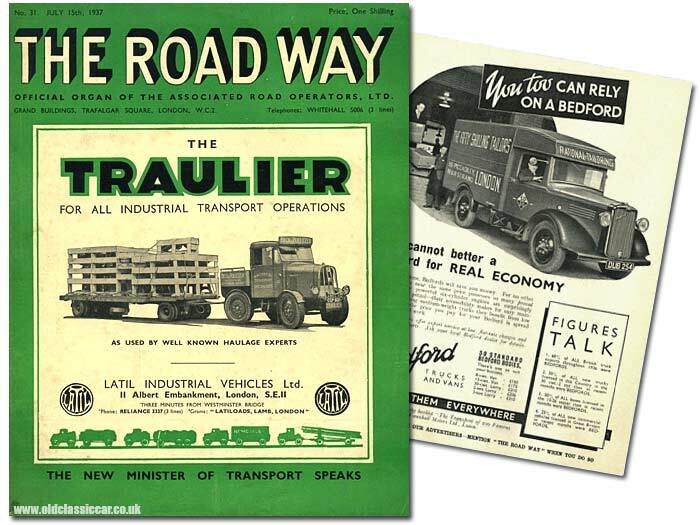 If you'd been a lorry operator in the late 1930's, and were a member of The Associated Road Operators Ltd, you'd have received a copy of The Road Way magazine through your letterbox every month. This issue dates to July 1937. The cover features an advertisement for Latil Industrial Vehicles Ltd, illustrated by a Latil lorry and trailer combination (the "Traulier") in the livery of Beck & Pollitzer (Machinery Transport Specialists). A number of organisations set up with the interests of road hauliers in mind, merged in the early 1930's to form the Road Haulage Association (RHA). In 1935 the RHA was joined by the Motor Hirers' & Coach Services Association, forming a new group re-named Associated Road Operators Ltd. In 1945 ARO underwent another overhaul of the member groups, culminating in the re-formation of RHA. The magazine in my collection is Number 31, did it continue in print during the war or did ARO magazines only appear prior to WW2? Unsurprisingly this pre-war magazine is littered with cracking old advertisements for lorries, suppliers of commercial vehicles, and lorry accessories, many of which are now long-gone. What did surprise me though was how many American lorries feature. Given that US trucks seem to feature to a much lesser extent in lorry magazines of the 1950's, this pre-war magazine has quite a selection in its pages. The first hint of stateside iron comes in the dumpy form of the REO 15cwt van - "A truck-built van with commercial vehicle stamina". Two versions of REO's Silver Crown engine were offered, a four cylinder 16.25HP designed for local delivery work, and a six cylinder 24.38HP version for longer trips. Prices were £175 and 180 respectively. Both American and British lorries are advertised in this magazine. Page 25 includes a half-page ad for GMC (General Motors Corporation) trucks, ranging from a 1-ton with either 9'4" or 10'6" wheelbases, to the range-topping 4-ton models. A photograph of an eye-catching GMC COE (Cab Over Engine) truck - more usually referred to as a forward-control within the ranks of British lorries - definitely looks the part. A few pages further on and there's a full-page ad for Dodge lorries, illustrated by a much older vehicle that had covered over 250,000 miles while in service with Belling & Co. Ltd. The company's slogan was "Dependable - Durable - Dodge" and the Belling lorry was a brilliant example to feature. I hadn't realised that the Oldsmobile brand name had appeared on lorries in this country. Part of G.M., my guess is that they were badged-engineered Chevrolets and/or GMCs. The advert features photographs of both a standard-cab tipper, and a COE. A full page ad for the Diamond T - ".. not built down to a cheeseparing specification or to a low set figure governed by fierce price-cutting competition" appears inside the rear cover, although no actual vehicles are shown. In addition to adverts for the lorries themselves, there were quite a few suppliers who dealt in American truck parts prior to the war. A number of adverts appear throughout "The Road Way" for Jack Olding for example, his organisation could supply vehicles and any spare you could possibly need to keep your Dodge on the road. M. Thomas of Woolster Street in Plymouth was your man for REO parts, and in the same town S.J. Skinnard & Son Ltd offered a similar service for Dodge owners. Despite the good coverage of American trucks, the ads for British lorries still dominate the pages of this magazine. Adverts for Foden, Bedford, Commer, Morris-Commercial, Scammell, Thornycroft, AEC, and Leyland Motors highlight just how prolific the lorry manufacturing industry was, at one time, in this country. 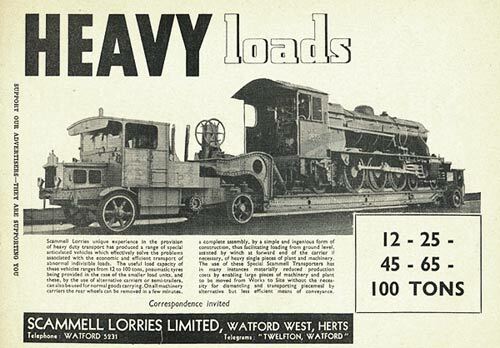 Of all of them, perhaps the most eye-catching is for Scammell's range of heavy haulage vehicles, capable of hauling loads from 12 through to a whopping 100 tons. A steam locomotive, loaded onto a Scammell trailer, is seen being towed behind an equally substantial-looking lorry, running on solid tyres. The majority of the magazine's articles relate to transport regulations, comment, and interviews with leading lights within the haulage industry. Many of the articles are a little "dry", and as a result, they aren't all necessarily too fascinating to read now. There was however much interest in the attendance of the new Minister for Transport, the Rt. Hon. Leslie Burgin, at a recent A.R.O. function, although it seems he wasn't giving much away, being very new to the post. A number of references appear in articles throughout the magazine, suggesting a level of friction between the road haulage industry, and the rail companies. With the increasing number of lorries hitting the road at the time, the rail industry no doubt was becoming ever more protective of its share of the haulage pie. They were extremely keen not to lose out to the lorry companies who, after all, could offer the convenience of door-to-door deliveries, something not available to the likes of GWR and LNER for example. "T" Trailer plates to become mandatory. October 1937 would see the mandatory fitment of "T" plates to all trailers. Advertisements for suitable plates, incorporating Red Prismatic Reflectors which passed the National Physical Laboratory Test, were provided by two firms - Homo Ltd from London NW1, and the Star Sign Co. of Southport. Both were of "... very sound design and durable construction". Return to the motoring magazines section, where examples of other pre-war titles, including The Commercial Motor, are included.